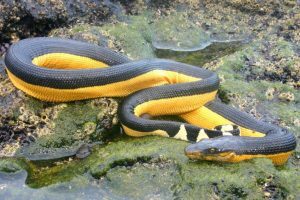 The yellow-bellied sea snake, also known as the pelagic sea snake and the yellowbelly sea snake is a venomous snake found in the waters of the Indian and the Pacific oceans. 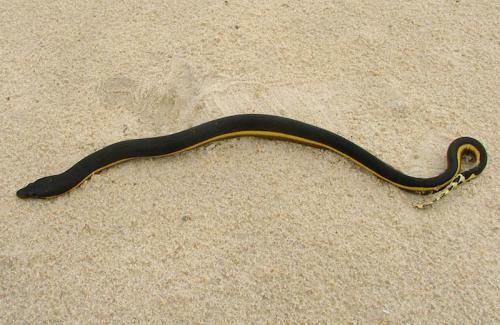 Size: Yellow-bellied sea snakes can reach a length of around 3.7 ft (113 cm). Color: They have a brown back and yellow ventral side. The tail is yellow with black spots. They are found throughout the Indo-Pacific waters. The regions in which they are found are Madagascar, East Africa, Arabia, and India. They are also abundant in the waters near Southeast Asia, Japan, Indonesia, Australia, New Zealand and the islands in the Pacific. Their range extends to the western coast of North and South America. They prefer tropical and sub-tropical waters. They live near the coast in shallow waters with temperatures between 53°F to 97°F (11.7°C – 36°C). 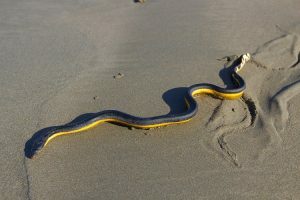 When the time comes for yellow-bellied sea snakes to shed their skin, they twist and coil upon themselves for hours on end to loosen and eventually make the old skin slough off. They have a fairly mild disposition. They are piscivores and feed on fish. The mating season for yellow-bellied sea snakes varies across their range depending upon the water temperature. In waters that are relatively warm throughout the year, mating is year-round, but for inhabitants of waters that are cold most of the year, the snakes have to wait for the warmer season to mate. They are ovoviviparous with a gestation period that lasts around 5-6 months. The litter size varies from a single offspring up to about 10. They are around 8.7-10.2 in (220-260 mm). They start feeding from the first day of their lives. 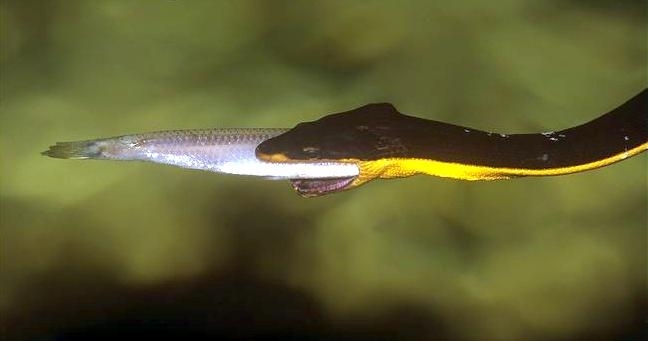 Females reach sexual maturity when they reach a snout-vent length of around 24.5 in (62.3 cm). Information regarding their lifespan at sea is inadequate but in captivity, they have been seen to live for up to 2 years 1 month. The ventral scales of this snake are adapted to help them propel themselves in the water. They can reach speeds of up to 2.2 miles/hour. They have a salt excreting gland under the tongue using which they get rid of excess salt from their body. They can breathe through their skin helping them to stay submerged for longer durations. The bright coloration of the body acts as a warning to predators about their potent poison. 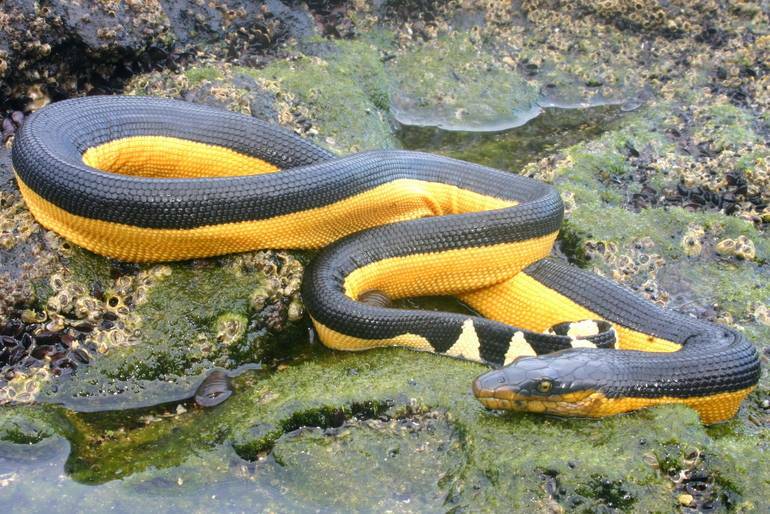 The yellow-bellied sea snake does not have too many predators. 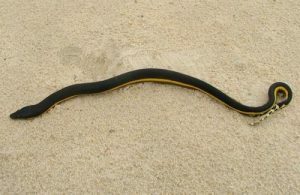 Potentially, large fishes, birds, and marine mammals can prey on this serpent, but such cases have never been observed. 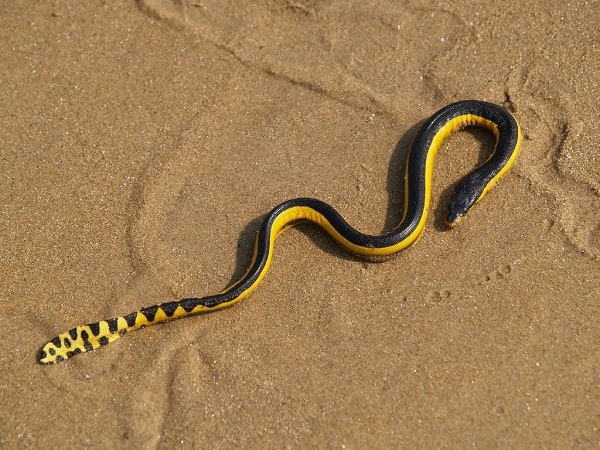 The IUCN categorizes the yellow-bellied sea snake under their ‘Least Concern’ list. 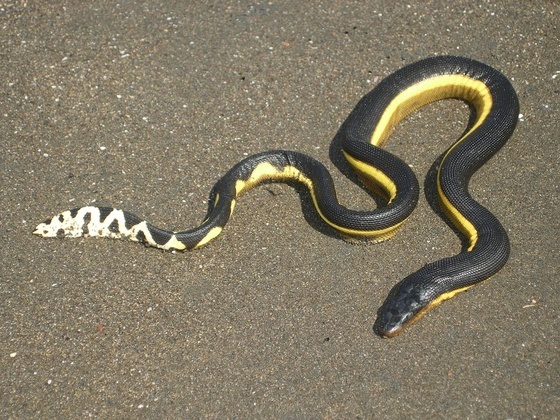 The venom of the yellow-bellied sea snake is a neurotoxin, but its bite does not pose a threat to humans. 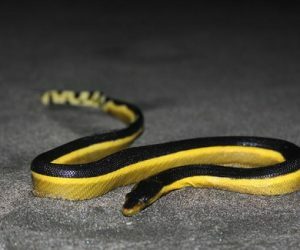 It is one of the most unique snakes in the ocean. In 2015 there were regular cases of the yellow-bellied sea snake washing ashore in California.